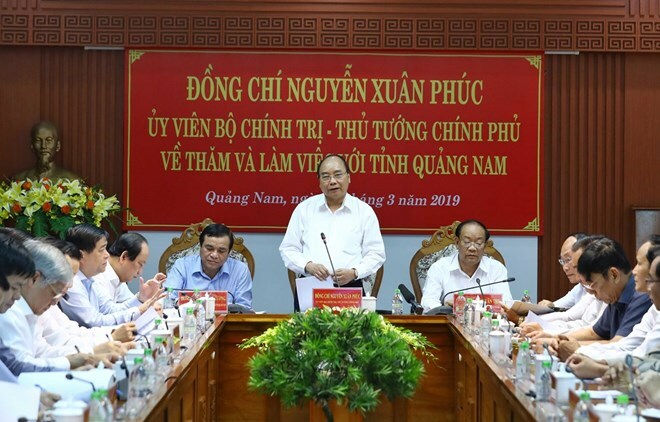 Quang Nam (VNA) – Prime Minister Nguyen Xuan Phuc has set the goal for the central province of Quang Nam to double its economic scale in the next five years. Addressing a working session with the province’s officials on March 23 on the occasion of the 44th anniversary of Quang Nam’s liberation (March 24, 1975-2019), the PM said Quang Nam should strive to become a new growth polar in the central-Central Highlands region along with Quang Ngai province and Da Nang city. Once among the three poorest provinces in the country, Quang Nam has risen up the ranks thanks to local officials’ innovative spirit, PM Phuc said. He attributed the province’s strong growth to effective efforts in administrative procedure reform and in defining strategic industries for development. The Government leader also hailed Quang Nam for its good work in Party building. According to reports at the meeting, Quang Nam posted an average growth of nearly 13 percent over the past three years. Tourism was a driving force with an annual growth of nearly 20 percent. The province has been among the 10 top-ranking provinces in the Provincial Competitiveness Index for the past three years. It is currently home to 166 valid foreign invested projects with total capital of more than 5.78 billion USD.